Well that what the title of this blog post says. Although if you look at this picture it doesn’t look clear at all! This is raw linseed oil with two tablespoons of calcium carbonate, called whiting it is chalk, in a very fine pure grade. Commonly used as a pigment, mild abrasive, filler and putty, calcium carbonate CaCO3 is used to clarify wine and beer it also has the unique ability of neutralizing acids by giving of CO2. 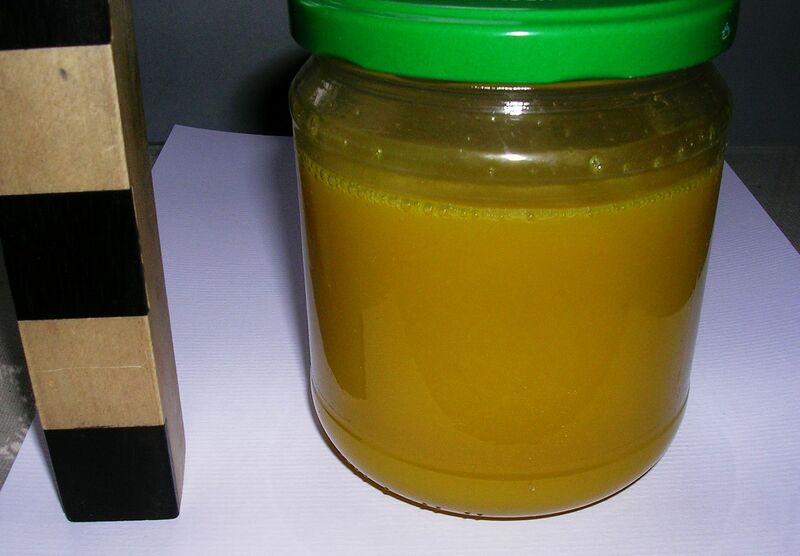 It has many other uses one of which is to clarify the oil, it will precipitate out the water soluble fatty acids and turn this raw linseed oil into a drying oil by chemically ‘boiling’ the raw oil. Now this doesn’t look clear now, when I mixed it in I had to repeatedly shake the jar to get all of the larger particles into smaller ones and when no other large particles were observed, I will allow it to rest and settle out. I will let natural stratification take place. I will then decant of the oil for use. Here is what it looked like after it had settled out overnight. It will take longer for this to completely clear up, I will keep you posted. This might be a good reason to build a centrifuge. I am not sure how old this technique is but it appears that Rembrandt used nothing other than linseed oil and chalk in his painting mediums and they have not suffered from the acidification associated with very old linseed oil. They don’t yellow, don’t wrinkle, don’t suffer from lead soap and seem to last unchanged. That is good enough for me. Ok, all these linseed oil posts have convinced me to do some experimenting. When will the book be available? 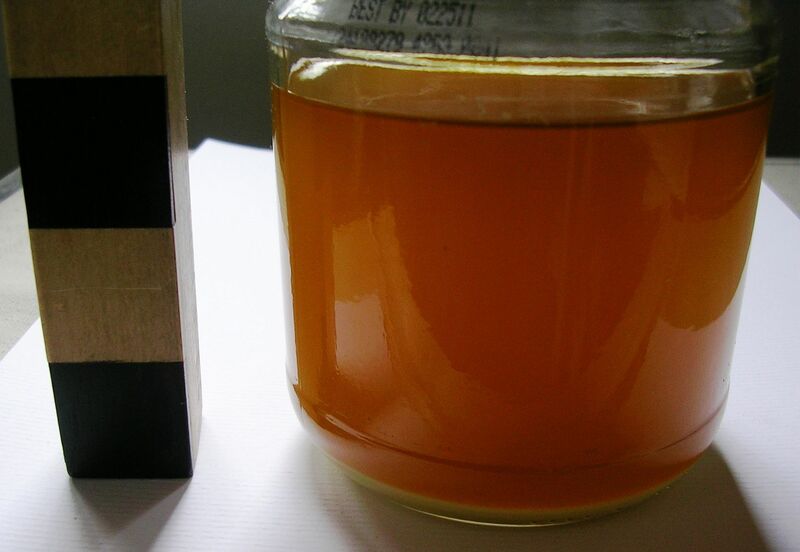 I enjoyed reading your blog post here about clarifying (boiling) raw linseed oil. I see your reference to Rembrandt and wonder did you simply try this out based on that information or did you get this experiment somewhere? I am writing a book on earthen floors, in which we use processed linseed oil. I mostly use a blend I have sell, but I am trying to include options for the readers. If this is your experiment could I put it in my book and list you in references? Thank you for considering and sharing. The information about Rembrandt using linseed oil/whiting is well know in the art history community, you can check the libraries and museums of Holland. As for using linseed oil for dirt floors, I mentioned that in my book Shellac, Linseed Oil, & Paint – Traditional 19th Century Woodwork Finishes, as well as other methods of making dirt floors. Wow thanks for the great book, Shellac, Linseed Oil, & Paint – Traditional 19th Century Woodwork Finishes! We have been enjoying the information and love the layout! You mentioned in your previous response that you talk about dirt floors in the book. We have not looked at every page, but have not found this part yet. Give me some direction as to where it is in the book. Our book will be out in March! Stephen, what was the end result of this experiment? I see a reference to using Calcium Carbide for clarifying Linseed oil in “Drying oils, boiled oil, & solid & liquid driers” by Louis Edgar Andrés, but no other references to using calcium carbonate. I am curious, yet suspicious. I will have to try it myself.